It was 89 years ago that a young British immigrant to Carleton Place by the name of Billy Moore began what is now believed to be the second Scout troop in Canada. The first was formed in Merrickville two years before. But for Billy Moore, scouting was the best thing that could happen to the young boys of his adopted town of Carleton Place, and he wasn’t long in gathering together a group of boys and marching them over to the Anglican Church to prevail upon Canon Elliott for sponsorship. Billy Moore had fought alongside Baden-Powell in the Boer War in Africa in 1899, and he was so impressed with the British Colonel and his values that when Baden-Powell started the world Scout movement, Billy wanted to be in on the gournd floor. Billy’s friendships at the time of the Boer War include that of another young Britain, Winston Churchill. Some of the very first member’s included Billy’s own son, Percy, who was to later lose his life in the first world war. Other charter scouts included Dawson Emerson, Cecil Bryce, Jimmy Prendergast and Skinny McGuire. The first headquarters were in space loaned to Billy by the Bates and Innes Mills. It was an old warehouse on Bridge Street, but it served the purpose well. It was here that the movement went on to produce the four youngest King’s Scouts in Canada. They were all under 13 years of age at the time. These four young boys were Howard Foote, Jimmy Misner, Walter McIlquaham, and Gibson Craig. Tests were much harder in those days than they are today. King’s Scouts had to win five badges which was no easy feat. Those early scouts remember the camping outings to McCreary’s Shore on the Mississippi as being a wonderful time of fun and learning experiences. Max was the camp bugler, so he was the first out of bed in the morning. Everyone slept in tents and Alice Moore, Billy’s widow, remembers taking a few Carleton Place boys into her tent in the middle of the night because they were homesick. “One young man who will remain nameless because he is a grown man still living here used to cry for home every night. Nothing would console him. Eventually, we’d have to bring him in our tent and bed him down beside Bill and me. This went on for the entire duration of the scout camp,” she laughingly remembers. Billy Moore had a wonderful sense of humor, with just the right ring of discipline in his voice. He could laugh at little mishaps and setbacks, but he was adamant about protocol in the movement. Everything had to be done to the letter. There was no such thing as ‘almost right’. It was either right or it was wrong! Eventually the scouts moved their headquarters to the Sample Rooms of the Mississippi Hotel. This is where the countless travelling salesmen set up shop to show their wares to the valley merchants. But room was made for the scout meetings, and they continued to meet here for many years, compliments of the McIlquham family, owners of the hotel. It appears that the Scouts moved around a bit with their meeting place. Probably because most of the locations were obtained rent-free. At one time some of the original members recall the meetings being held in the Orange Hall as well. 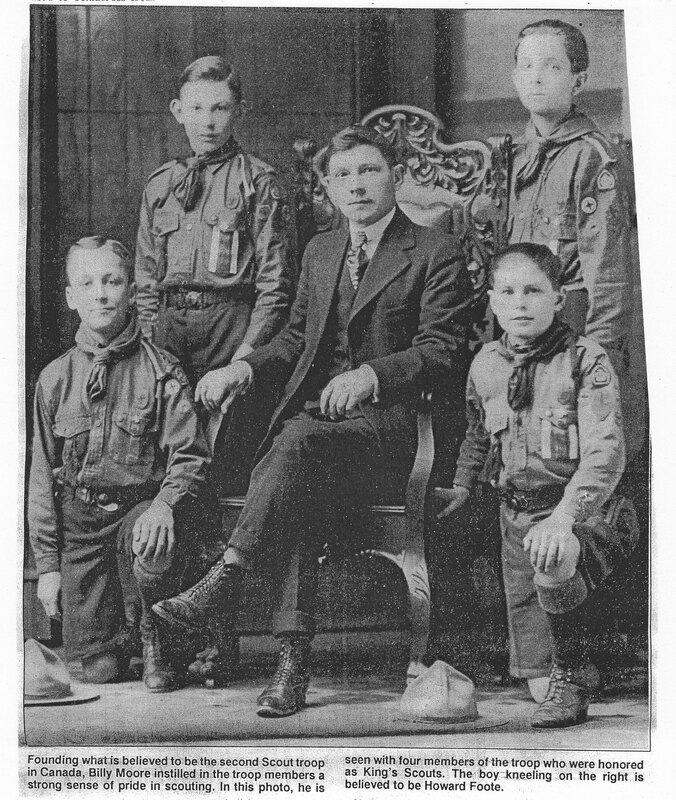 By 1937, scouting was well established in Carleton Place. It had been organized for 27 years, and dozens of young boys had joined and gone on to high standing in the movement. Billy Moore continued to be the leading figure, and he worked at broadening the horizons of scouting on the local level. That was the year a young Max Gladish was one of the scouts who would be trying for his Royal Life Saving Society medal. Billy Moore was determined that his boys would have a good run at it. “We were taken to the Chateau Laurier for the tests. I’ll never forget the thrill of swimming in that big indoor pool. If we were going to be trying for that medal Billy Moore wanted to be sure we had the best possible facilities.” They passed with flying colours. In the late ‘30s, there used to be a vacant lot on the corner of Albert and Beckwith Streets, across from the present Rebekah Lodge building. Later Ed Beaton was to build the brick bungalow that is there now. Billy Moore thought it would be nice if the scouts learned a bit about building. So he got permission to build a log structure on the site, and he put his troops to work on its construction. Bill oversaw the building, and the Scouts were understandably proud of the finished headquarters. It stood on the site for many years. Cliff Bennett, for many years a leader in the local Scout movement, has fond memories of his mentor. “We all respected Billy Moore. I recall a Regional Camporee, which was a competition camp for local patrols held at Hopetown. Billy was the guest of honor, even though by that time he was in his ‘90s and that was in the ‘60s. He was keenly interested in everything to do with scouting, although his active involvement had passed. But he always kept up on the troops and I can remember going down to his house at the end of Allen Street next door to the curling club, where he lived out his last years. Those visits were just like campfire days. He would talk for hours about early scouting days, and his dreams for scouting in the future. And he’d talk about the Boer War and his friendship with the scouting founder, Baden-Powell. It was like being in another time frame. I cherish those memories of those visits very much,” Cliff says. Baden-Powell once gave Billy a flag. He was very proud of it, and kept it for many years. And then as he was less and less able to take an active part in the local scouting movement, he wanted someone who appreciated the history of Carleton Place’s troops to have the flag. “He gave me the flag. I was so moved. But I knew the flag really belonged to the whole Canadian Scouting movement, and so I presented it to the Scout Museum in Canada,” Cliff says. Many years ago, a trophy was made out of a bit of twisted wood. It was nothing spectacular…just a piece of wood form the Ottawa Valley. It became the Billy Moore Trophy.